This thing really rocks. 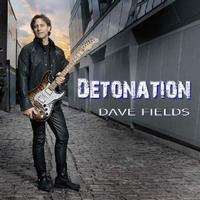 Dave Fields is a bluesy rocker, to nail him in a short description, but he’s a lot more, too. There’s some psychedelia along with hard classic rock like Hendrix and Deep Purple. However you describe the mix of sounds, though, this is a killer disc that’s likely to make my best of 2012 list. The blues guitar fires out from the onset. When the rhythm section comes in, it almost feels like a cross between Hendrix’ Experience and Stevie Ray Vaughn, but the vocals are more pure rock and roll. It’s killer blues rock that’s classic and very tasty. The instrumental break surely brings in a lot more of those Hendrix references, but the organ solo calls to mind Deep Purple. The guitar soloing is incendiary and magic. This is classic rock at its best. It feels familiar yet fresh. We get a ton of psychedelia on the introduction to this. It eventually settles into another blues based hard rocking jam that’s very tasty and very classic. There are some bits of female vocals sprinkled on this one and it’s another killer. While it feels like it belongs with the other one, it’s certainly another side of the coin. While this number is more along the lines of pure blues (think Buddy Guy) there’s still plenty of rock in the mix. It’s got some smoking hot guitar work and is another winner on a smoking hot disc. A short noisy introduction reinforces that Hendrix comparison. Then percussion takes the piece and it feels very psychedelic as the other instruments join. When it drops back for the vocals, though, this feels very much like a melodic classic rock. Free is probably a pretty good comparison. More of that Hendrix-like guitar returns for the instrumental section later in the piece, but after that it works out to a more modern rock sounding arrangement. That said, there’s still plenty of classic rock in that mix of sounds. There’s a lot of reggae on this, but it also has some sections that are pretty much pure mellow blues. This thing is a great combination of sounds and shows yet another side of this killer artist and album. With more of a modern bent to it, this is a hard rocking tune that’s accessible and very tasty. I really like it a lot. There are quite a few changes as this thing continues and some of them are a little strange, but in the best psychedelic rock meets prog rock way. This thing is both modern and classic and it’s got some more of that killer guitar work. It’s one of the most unusual and intriguing pieces on show. While this beast rocks out, it’s mellower than some of the other stuff here. It’s also probably more closely tied to the sound of Stevie Ray Vaughn than anything else on the set. That said, this is far from a carbon copy. It’s certainly got Field’s unique soundstamp all over it. It is also one of my favorite pieces on the disc. Considering the quality of everything here, that says a lot. In a lot of ways this is the most modern, alternative rock based tune of the whole album. It’s still got plenty of the old faithful sounds within it, but it’s almost progressive rock in a lot of ways. Mind you, that’s a modern prog versus the classic genre. A more pure blues number, this is classic and very emotional. The guitar truly drives this beast, but the vocals give it a run for its money. While a lot of this is mellow, it gets fiery when it needs to. Besides that, the vocals purely scream out their pain over the top of the laid back backdrop at times. This one stands beside the blues greats like B.B. King. Yes, it’s that good. The opening section here has some smoking hot blues rock. From there, though, it works out to more of a rock groove that’s got both alternative rock and classic stylings, along with plenty of blues, in the mix. There’s more of a pure blues jam at the end. This beginning of this song reminds me of Jimi Hendrix’ “Waterfall” with a lot of Robin Trower in the mix. As it continues it works out to a rocking blues jam that’s quite tasty and a real screamer. There are a number of changes and shifts and at times it comes quite close to progressive rock. This power ballad has plenty of classic rock and blues in the mix, but the vocals even bring some country rock to the table. It rocks out a bit more later in the tune.